Office chairs have looked ordinary for a long time until some fanciness began coming in office furniture. They used to be stiff and functional but nowadays, there is a little more edge about them. Office chairs look great and aesthetically appealing. But there are a couple of things that you could do to switch up your style with the office chair. You can be able to apply some tricks office chair suppliers in your workplace might just decide to emulate. Apart from fancy designs and creative office chair designs, there are hygiene tricks office chair users can use to clean their chairs. These chairs are vulnerable to spillages, odors and stains which can be difficult to get rid of. They are not a good reflection of your personality and you need to get rid of those stubborn stains before you are construed as clumsy and untidy. There are several cleaning tips you can pursue. You can use home-made shampoos to clean your office chair. It is cheap as compared to what you buy from the shop. You should dilute with warm water before you begin. You should not clean with a scrubbing motion but you should blot and spread the shampoo in a circular motion and use a clean, damp rag to wipe off the stain. Stains should be cleaned immediately they occur. A foam upholstery cleaner can be used to clean chairs with ease. They do more than just clean them but they deodorize and freshen the chair leaving your working environment fresh. You can get rid of those bad smells that can be left behind by certain foods and drink spillages, since the first thing that a visitor will notice is the smell before they even see the nature of the stain. It is the solution for bad odors. To clean using this method, use a damp rag to dampen the fabric of the chair but do not soak the material, then spray the cleaner and wipe off with a clean rag. The excess moisture left should be removed with a dry towel. 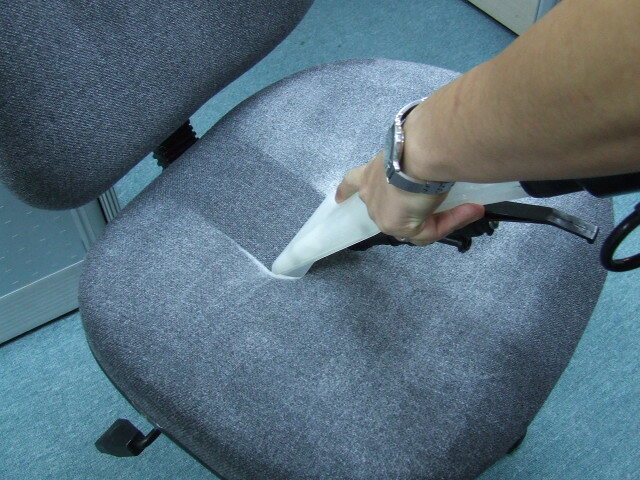 Another trick for cleaning your office chairs is using a cleaning solvent. These work well if they are used promptly, as soon as the material is stained do not delay. Apply the cleaning solvent directly on the stain then use a scrubber to work the paste onto the stain, allow it to sit for 10 minutes and with a damp cloth, you can buff the stain out. The vinyl upholstery option will require you to spend a little bit more as it is an upgrade. It will save you the trouble of having to perpetually clean the fabric of the office chair. You can go with this option if you want to prevent stains on chairs, you can choose vinyl upholstery instead of fabric. So as you can see those are just a few tricks office chair hygiene entails. When someone gets into your office, there should be a freshness and tidiness on all your office chairs so that even visitors will not be put off. Let your office environment be welcoming and pleasing by taking care of your best office chairs.